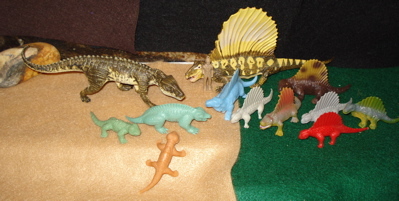 The Permian Period produced some fine Dinosaur toys. That's Permian Period, not Permanent Period. As can be seen they were quite good at what they did as this Carnegie Dimetrodon finds the hollow MPC Moschops particularly easy to get into. In reality the Dimetrodon was about ten feet in length and 5-600 pounds, making it significantly smaller than the Moschops (16 feet and ~one ton) and probably requiring pack-like cooperation to obtain their Permian repast. As a side note and interestingly, the Dimetrodon (name meaning "two-teeth"- as it had different kinds of teeth) is a closer relative of ours than it is to the Dinosaurs. The Sphenacodon was another top Permian period predator and predated the Dimetrodon. It, too, most likely preyed upon the poor Moschops. A l..o...n....g suffering herbivore. Being ~10 feet in length and weighing-in at about 250-300 pounds the Sphenacodon also must have often hunted in packs in order to bring down that popular Permian period prey and menu staple, the mighty tasty Moschops. The Sphenacodon was a carnivorous Pelycosaur and as you can see he also took no prisoners, just pate. The Permian period ended in a mass extinction about 250 million years ago referred to by Paleontologists as the "Great Dying." Possibly brought about by a combination of vulcanism and an asteroid impact. Look it up. To find out more about The Permian Period click on the highlighted text. Once again small size, 3-4 feet long and 80-120 pounds, fated this apex predator to be a pack hunter as well. Here seen attacking a herd of Marx Plateosaurs, an early pro-sauropod and a true Dinosaur in its own right. The Permian Period just hasn't produced a great range or variety of Dinosaur toys, to date. There are several other manufacturers whose product I don't have, or sold before I decided to do this website. 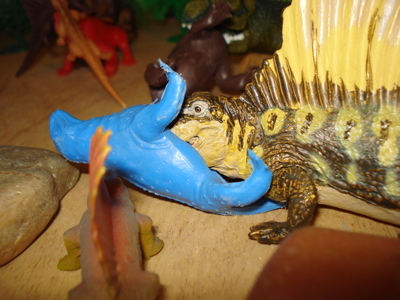 For instance UKRD makes an especially nice Dimetrodon that I once had a dozen of and Invicta made a beauty that I have never had any of. So it goes. 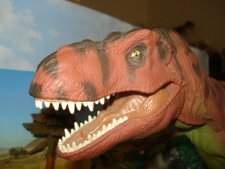 You can find these and other, actual Dinosaur toys, listed by company or go directly to Dino-Central to see what else we have to offer.